New malware program PoSeidon targets retail POS credit card terminals. Lazarus Alliance QSA services protects clients against it. The stunning reality is that the majority of retailers accepting credit cards are still vulnerable to the newest threat to accepting credit cards from consumers. Lazarus Alliance has been years ahead with proactive cyber security services. Researchers from the Cisco Security Solutions team have dubbed the latest malware to attack point-of-sales (POS) systems PoSeidon. Compromised POS systems are vulnerable to these attacks, which allow the RAM of an infected terminal to be scanned by the malware. PoSeidon looks for unencrypted credit card data, and then transmits that data out to an exfiltration server controlled by the cyber criminals. This technique has long been known to security experts. The Proactive Cyber Security™ services at Lazarus Alliance has been years ahead of this issue by offering solutions to companies that utilize POS systems that ensure this memory scraping technique does not compromise a payment process. As long as organizations remain reactive instead of proactive in their approach to cyber security, they will continue to fail the constituents they work to protect. The PoSeidon POS malware program is another example in a daunting list of the challenges that face organizations concerned with their PCI DSS stance. As a PCI DSS audit Qualified Security Assessor (QSA) company, Lazarus Alliance has been approved by the PCI Security Standards Council (SSC) to measure an organization’s compliance to the PCI DSS audit standard. 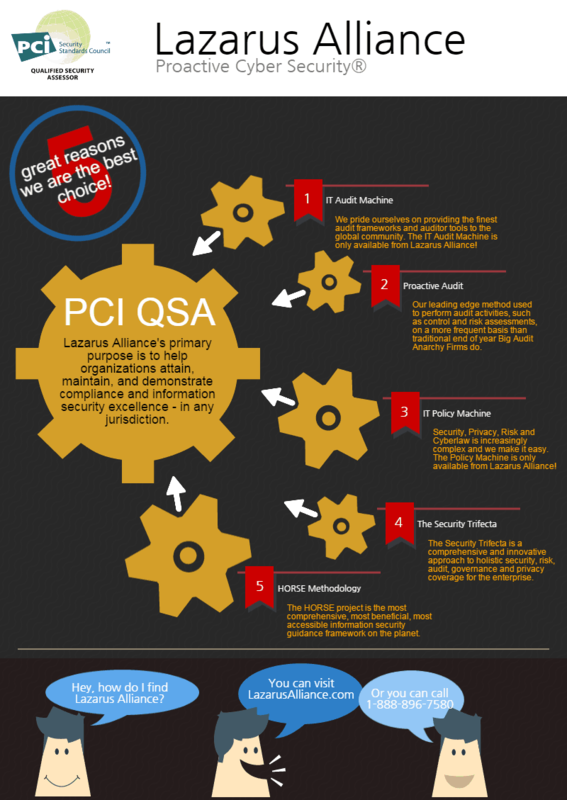 Lazarus Alliance specializes in providing our clients with scalable, efficient solutions for meeting the rigorous demands of Payment Card Industry (PCI) compliance. We do this in part because of our breakthrough proprietary technologies called the IT Audit Machine (ITAM) and the Policy Machine.